You may have watched on BBC TV the nail biting “Ice Getting Thin” documentary on Cross Rail Building, the new £15 Billion Railway in London. Well Hydroblast has had a small but important part to play during the making of this new concrete lined tunnel. “Its tougher than anyone imagined” says Linda Miller on the BBC programme. She was right! We had to break out a big hard block of concrete right in the middle of the tunnel floor. Hydroblast were asked to remove an area of concrete 5m long , 4m wide and 1m deep , leaving in place all the rebars , and not to damage or crack the existing new slab , tunnel walls and tunnel roof. Look at the red hatching on the picture above , this shows the SUMP of the railway, in other words the lowest point of the tunnel. Should there ever be water ingress into the tunnel , a sump is needed to allow the water to run to , then pump out. We placed our Hydrodemolition power pack on the surface and ran High Pressure hoses underground, routing them down the ventilation shaft. 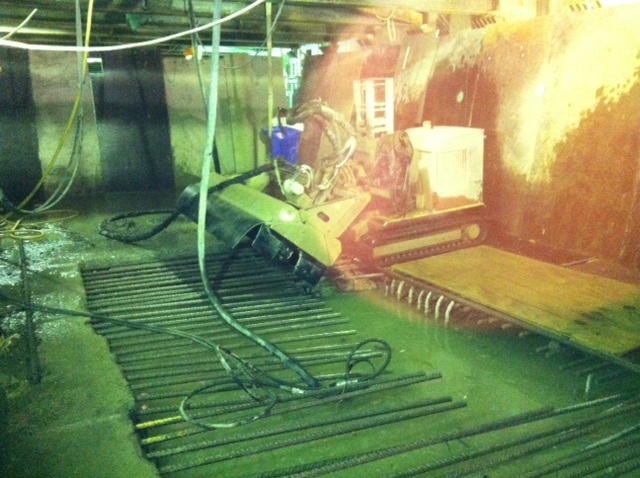 We then drove our robotic Hydrodemolition machine into the tunnel and started blasting. 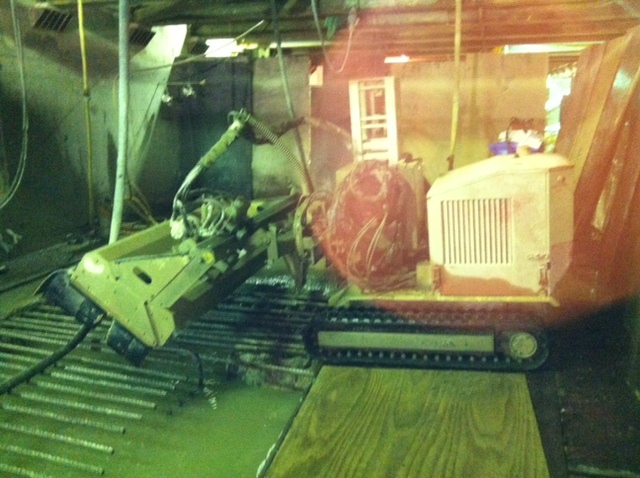 Again , we may be a small company – but we have a very important part to play in Hydrodemolition on large projects.